If Belgium’s contribution to world peace & happiness is chocolate, than surely Italy’s is Nutella. Pietro Ferrero, the brilliant mind behind ‘crema giandujot’, invented a chocolatey hazelnut butter during WWII, when chocolate was scarce and the traditional European chocolate butters that his children adored were no longer available. Pietro, driven by his desire to preserve his children’s happiness during the war, created a deliciously nutty paste of finely ground hazelnuts, milk and chocolate… and so ‘gianduja’ was born. Later, Italian chocolatier Ferrero-Rocher started marketing Pietro’s recipe as ‘Nutella’, and the rest is history. Filberts, aka hazelnuts, have long been on my friends’ list too. It’s no secret that Nutella and my double chin I have been tangled up in a love triangle since my sweet sixteenth. I finally swore off the stuff because – as a cruel act of nature – my hips would expand every time I even remotely glanced in the direction of something I liked sugary. I thought it would be fun to try and recreate Nutella. However, browsing the Internet for a recipe quickly became a Herculean task. From Vegan to French, pretty much all recipes called for the elaborate task of roasting, peeling and grinding hazelnuts into a fine paste and combining that with molten milk chocolate. I happen to know that Italian ‘gianduja’ is made this way, so I figured I could skip this step and create my own recipe using gianduja instead… The texture is not quite as creamy as Nutella, but the flavor is really close, in my opinion. You should be able to find the ingredients at your local specialty kitchen supply or baking store, or you can order most of it from Surfas online. 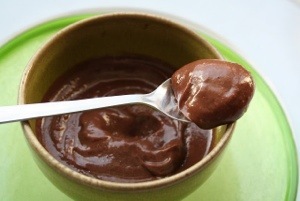 (*) if you decide to make your own gianduja, blend 1 cup of roasted & peeled hazelnuts with approx. 7 oz of melted milk chocolate and 1tbsp of butter. You will need a professional strength food processor or a vitamix, in order to achieve a fine paste or butter that is not ‘gritty’. Pour mixture out on a plastic lined baking sheet using a candy mold, and allow it cool outside the fridge in a chill area of max. 65F until it sets. You can then dice it or cut it as you like. Warm condensed milk and cream over medium to low heat. Add chocolate & cocoa butter and sugar, and melt everything together until it’s well-combined. Add hazelnut & vanilla extract and stir to incorporate the flavor. Give it a pinch of salt to your liking, and pour into glass jars. Allow to cool & harden in the refrigerator for a few hours. Yum! Love your site. Next time you are down here we need to cook!!! I think I need to get some of your mom’s recipes :0) Love your writing style!